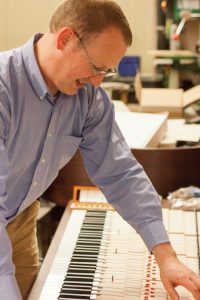 Brian Knox began piano technician work at a fine arts university in South Carolina while working on his piano performance degree. He gained much of his experience while maintaining over two hundred university pianos during an eight year period, working on all different makes and models of pianos. Brian also maintained a private tuning business away from the university. Since moving to Iowa, Brian gained more experience and exposure to piano rebuilding skills working with Premier Piano Service based in Walker, IA. In 2017, he relocated to Decorah, Iowa and is the Keyboard Technician at Luther College. He also maintains a private technician business servicing churches, schools, and individual clients. Brian is not just a piano tuner, but a piano technician. He services everything about your piano, not just the tuning!